The Latin word «classicus» or "exemplary" became defining for the style which further received the name Classicism. It was directed at creation of an ideal, from the point of view of antique heritage, interior. Severity of forms, interior geometry, clearness of spatial decision, logic of the layout and soft colours are peculiar for it. It is an ideal variant for people who appreciate constancy in combination with refined luxury. Proceeding from it, a sophisticated project of a bedroom was developed. In the bedroom interior ceiling plaster with gilding, classical decor, lightness, colour scale of furniture and textiles are ideally applied. These methods borrowed from classical style have made the room attractive and simultaneously functional. Both in the past and now the best variant of room décor is zoning of walls by mirrors. In this case, ceiling plaster is put in the corners, thereby creating a fine background for furniture and decorative furnish. As a rule, mirror symmetry differs by weak filling of the field and is papered inside with wall-papers, fabric or painted in pastel tone. Corners according to the area of mirrors are in harmony with ceiling furnish. Due to this the wall flows in the ceiling and perspective and volume of the room changes completely. Easy painting of the ceiling does not overload the interior, but brings stylised notes. In the last centuries the walls were decorated with alfresco painting, sophisticated and thin, it looked very picturesquely. But now this method is used seldom enough as there are fewer and fewer painters of this school. The main object of the interior is an interestingly decorated bed. Decor and colour scale of the upholstery of the headboard, coverlets and decorative pillows are modest. They create a special background transition from light walls to dark furniture. 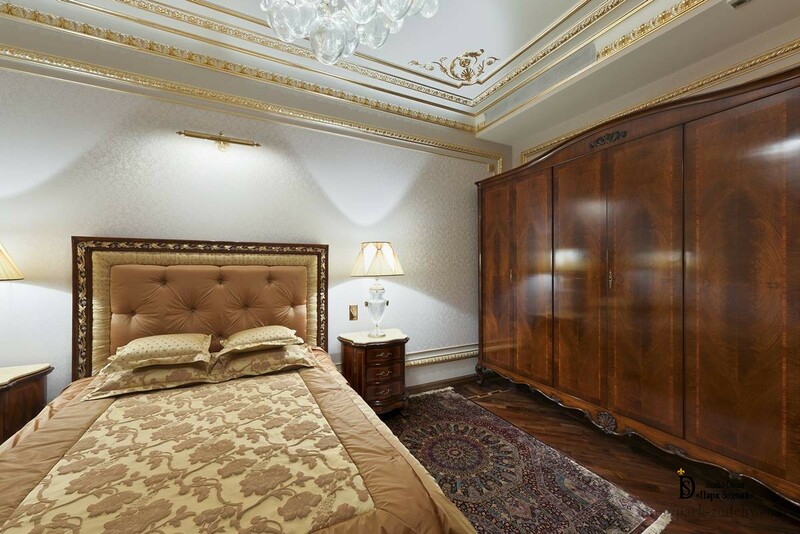 Large wardrobes are one of the acceptable elements of classical style. But dark colour does not look heavy in the interior as it is balanced by light furnish of walls. The interior is not overloaded due to the fact that gilt ceiling plaster of the air channel is visible over the wardrobes. The top border of the wall is visually raised and adds air to the room. Wooden decorative moulding on the furniture gives flexible lines, thereby balancing ceiling plaster geometry. Dark parquet was chosen for the floors which added colour palette of bedside tables and wardrobes. 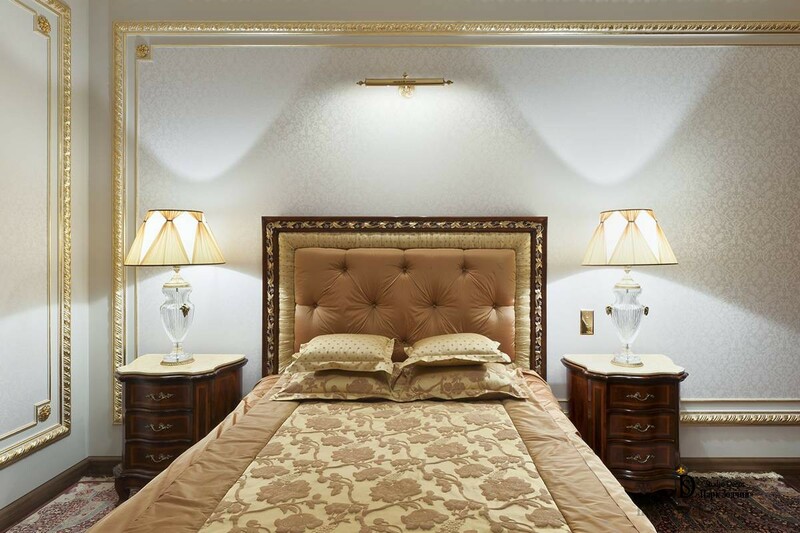 The bedroom in classical style should be provided with excellent lighting. Therefore multilayer decorative chandelier with elements from moulded glass looks harmoniously with almost weightless nightlights of delicate work and gives shining patches of light. It does not dominate in the interior and due to this does not lower the ceiling level. Wall bracket over the headboard gives additional light. In the interior there are no such decorative elements as sculptures or engraving. It is determined by the fact that limited space could be overloaded. And it is inacceptable for classical style with its accurately verified proportions and details.